My recent trip to London included Afternoon Tea at Fortnum and Mason, a chance to celebrate my parents 50th Wedding Anniversary. The Afternoon Tea was served in The Diamond Jubilee Tea Salon, the atmosphere was relaxing with the sounds of a pianist playing Debussy's Clair de Lune. The service and attention we received was exemplary, whilst warm and welcoming. I have my eye on those afternoon tea cakes! You will see from the photographs and menu, there was an excellent choice of sandwiches and cakes, they even included some plain sandwiches for some of us. We did not quite manage to eat all of the cakes, we left one scone and a chocolate cake. 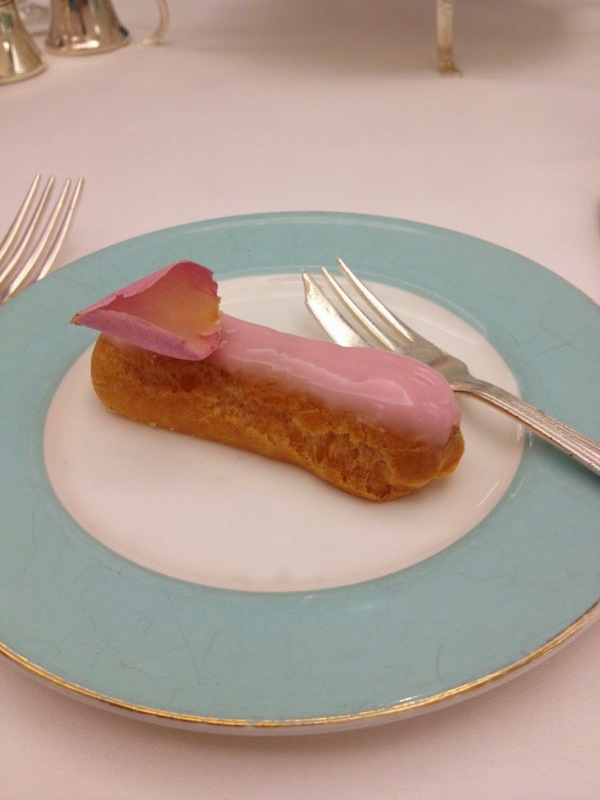 My favourite was the Rose Eclair, a light and slightly fragrant cake. Afternoon Tea at Fortnum and Mason cost £40 per person, which I thought was good value for the surroundings, atmosphere and quality of the cakes. Wow this looks stunning! Definitely on my visit list next time I'm in London. It looks so yummy! Especially all these afternoon tea cakes, I would happily try them.